Hervey Bay’s Dave Darmody runs the Australian Offroad Academy and tackling Fraser Island’s sandy tracks or teaching others how to do it properly and safely is something he does very regularly. This Easter, he’s back and he’s armed with plenty of tips for having a top Easter on Fraser Island (with pics by Eurong Beach's very own Zoe R). 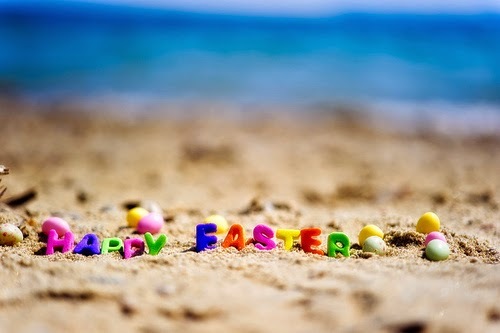 A Great Sandy Happy Easter from all on Fraser Island. Photo Origin: Unknown. So whether you’re staying on the sunset side of Fraser (at Kingfisher Bay Resort); tackling the surf side with a stay at Eurong Beach Resort or just heading across with Fraser Island Barges for a camping adventure with the family, you won’t want to miss these top tips from a Fraser Coast local. 1. It’s Easter, So Let’s Keep Good Friday, Well, Good! Early afternoon low tides make for lazy mornings and afternoons of trouble-free, wide-open beaches… but the big high tide at around 7am on Friday might make for some frayed tempers and heated engines. If you are heading up Fraser's famous 75-Mile Beach, you may just want to chill out and wait until low tide (you really should, it's better for you, your car and the island). Those coming across from Wanggoolba Creek or Kingfisher Bay will have a different set of challenges – fun challenges - if the weatherman is wrong and we don't get a little rain this week. Download the latest Fraser Island Condition Report. Try the Southern Lakes Drive - it has some 'challenging' sections and takes you through 20+ kilometres of gorgeous and diverse ecosystems. On this route, you’ll get to enjoy Lake Birrabeen (our favourite) and Lake Boomanjin... they're as equally lovely as beautiful Lake McKenzie. Further north of Eurong Beach there are a couple of lesser known lakes that are well worth a visit. Lake Garawongera, out behind Happy Valley, is a gem and the road from it to Poyungan Valley is worth a drive for the more adventurous. Likewise, finding your way to Lake Allom (and its famous Fraser Island Short-necked Turtles - pictured above) is a rewarding experience. 3. Keep Cool And Keep Your Cool. You can cool off in the Champagne Pools or Eli Creek... but when it comes to driving keep your cool! We know that everyone should slow down on the highway when it’s busy… well the same applies for the beach! It would also be great if drivers indicated their intentions and fishermen didn't park on the hard sand when there isn't much to be had. But you know what? Some just don't, or won't. 4. Where Are Your Kids? We love our Dingoes, but we hate it every time they make the news for the wrong reasons. Keep your food locked away; your kids close and check out QPWS' Dingo Safety tips for when you’re out and about in the Great Sandy National Park. Dave reckons the Eurong Beach Resort Bakery’s Chocolate Croissants are in a class of their own… but at this time of year, you might want to add our freshly-baked hot crossed buns to your shopping list – it’s the best Easter treat you’ll get for 75 long miles. Whatever you're up to this Easter, stay safe and stay happy. This blog has been reproduced with the author’s permission. Click here to read the original story OR find out more about Dave’s training courses on Fraser Island.